Here is a fast easy treat. Keep a wet cloth handy because your fingers will get sticky. 1 1/2 tsp. lemon juice. Heat a frying pan over medium heat, using NO oil or vegetable spray. 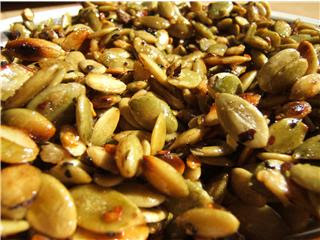 Add the pumpkin seeds & stir continuously, so they don't burn. When they start to plump & change colour slightly (about 5 minutes), add salt, garlic & chili pepper. Cook for a few minutes, then quickly add the brown sugar & stir until it has dissolved, then stir in lemon juice.